Caterpillar Local Host Plant: Asystasia gangetica (Acanthaceae, common names: Common Asystasia, Chinese Violet). 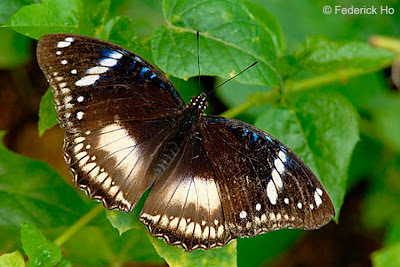 A female f-jacintha Jacintha Eggfly. A typical male Jacintha Eggfly sunbathing on a leaf perch. 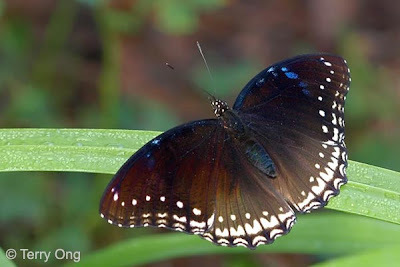 Above, the male is dark brown to black with a large purple-washed white discal patch on each wing, and a similar but smaller sub-apical patch on the forewing. A series of small postdiscal white dots can be found on each wing (note: these spots have been found to be absent in some specimens). The female is brown with a series of moderately large postdiscal white dots on each wing. Both wings have a whitish submarginal fascia consisting of double internervular white spots which are broader on the hindwing. 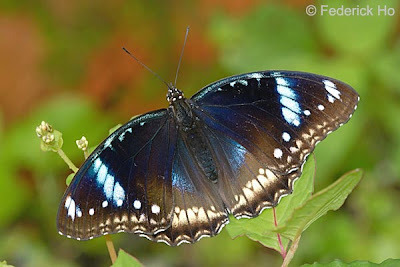 In female form f-jacintha, the forewing has some diffuse bluish markings beyond the cell. 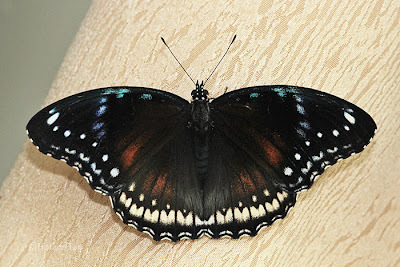 In contrast, the female form f-incommoda has these markings enlarged into a prominent whitish band and it typically has diffused bluish-whtie discal band in the hindwing. Intermediaries between two forms exist, and it is not uncommon for diffuse orange discal patches to be present on the hindwing, and in spaces 1b-3 in the forewing. 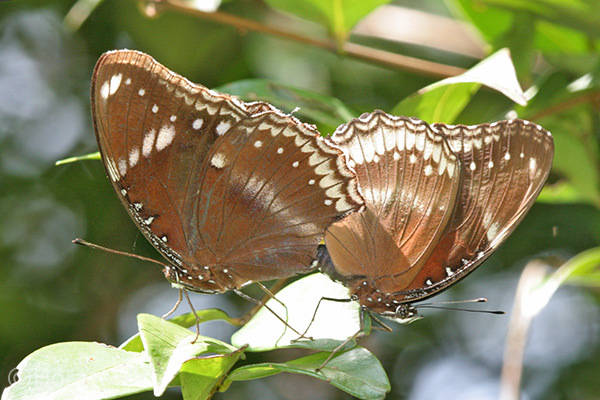 Underneath, the wings are orange brown to dark brown in both sexes, with the submarginal fascia and postdiscal white dots corresponding to those on the upperside. Both wings have a large prominent white discal band. 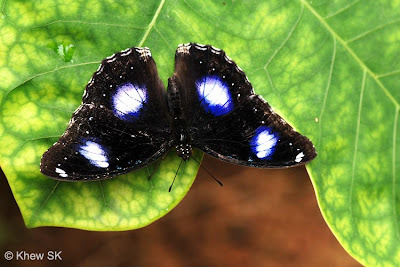 A female f-incommoda Jacintha Eggfly sunbathing. 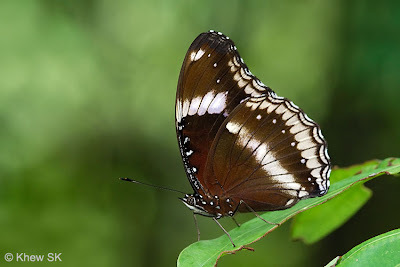 A variant of the female f-incommoda Jacintha Eggfly with a large white discal patch on the hindwing. 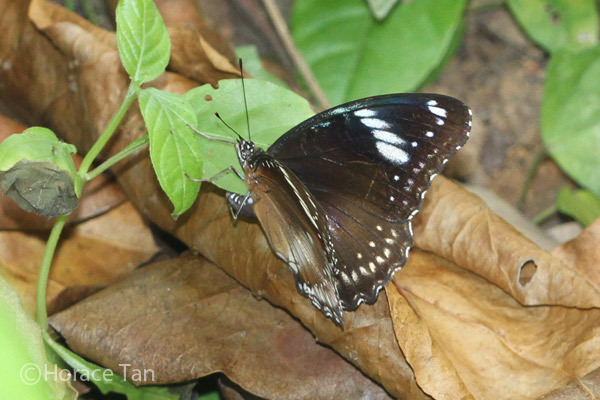 This (jacintha) sub-species of Hypolimnas bolina is common in Singapore, more so than the bolina sub-species (Great Eggfly). The fast flying adults are usually found in open bushlands, parks or fringes of nature reserves, visiting flowers and sunbathing on perches. The males are territorial and will guard a particular perch persistently even after being disturbed by other intruding butterflies. 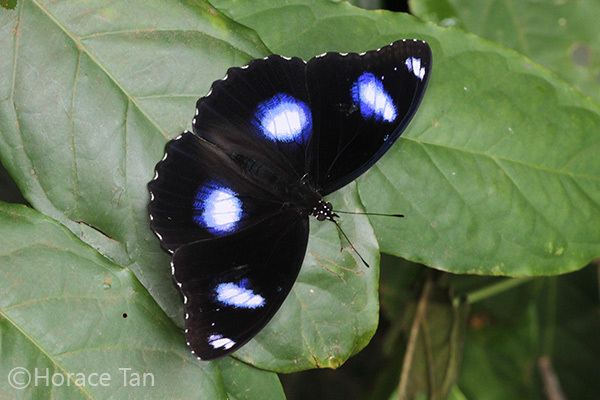 Another male Jacintha Eggfly on a leaf-perch. This variant has just a few postdiscal white dots on the forewing. 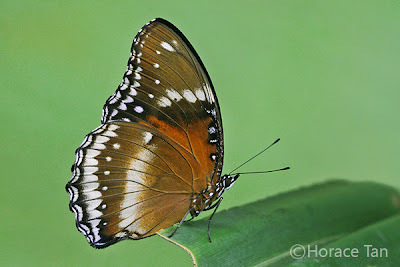 The underside of a female Jacintha Eggfly. The caterpillars of the Jacintha Eggfly feed on leaves and young shoots of the abundant weed, Common Asystasia (Asystasia gangetica), which can be found growing in untended lands in many parts of Singapore. The same plant is utilized as larval hosts by the immature stages of Autumn Leaf and Blue Pansy. 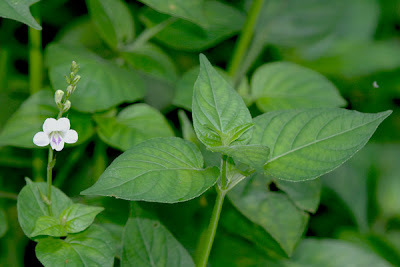 Local host plant: Asystasia gangetica. A mating pair of the Jacintha Eggfly found in a coastal park. A mother Jacintha Eggfly ovispositing on the underside of a leaf of the Common Asystasia. 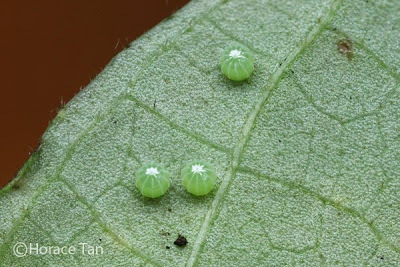 The eggs of the Jacintha Eggfly are laid singly or in small groups of two to four on the underside of a leaf of the host plant. The pale green egg is somewhat globular in shape but with a blunt top. Ten to evelen raised ridges run from the micropylar at the top to the base where the egg is adhered to the leaf surface. Numerous inconspicuous striations runs horizontally between these vertical ridges. 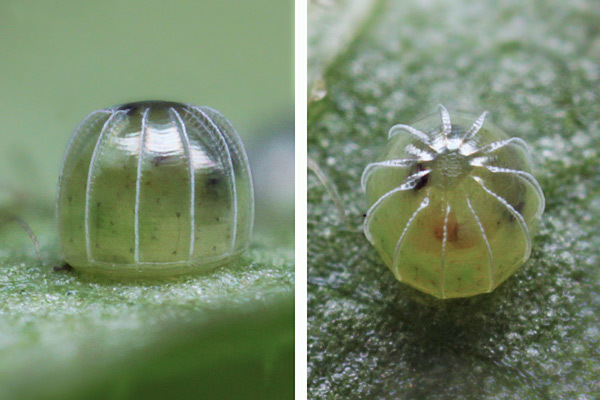 Each egg has a diameter of about 0.5mm. 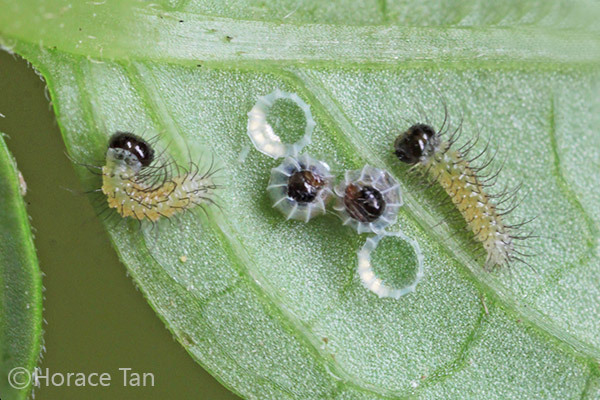 A group of three eggs of the Jacintha Eggfly laid on the leaf underside of the Common Asystasia. 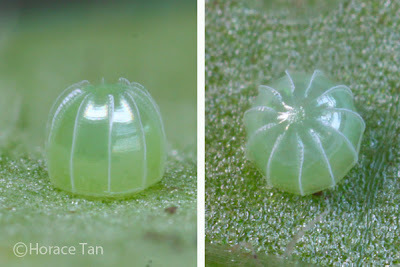 Two views of a maturing egg of the Jacintha Eggfly. The egg takes about 3.5-4 days to hatch. The young caterpillar emerges by eating away part of the egg shell. Much of the egg shell becomes the first meal for the newly hatched which is about 2mm in length. It has a cylindrical and pale yellowish brown body covered with many small and dark tubercles. Long, fine and dark-colored setae emanate from these tubercles. The head capsule is black, mostly round in shape with no visible horns. Two newly hatched caterpillars of the Jacintha Eggfly, with another two about to emerge. Two views of a newly hatched caterpillar of the Jacintha Eggfly after its first leaf diet, length: 2mm. The 1st instar caterpillar feeds on the lamina of a leaf and between feeds, it typically rests on leaf underside against the midrib. The leaf diet gives the caterpillar body a strong dark green undertone. Its growth is rather rapid, and after reaching about 4mm in 2days, the caterpillar moults to the 2nd instar. 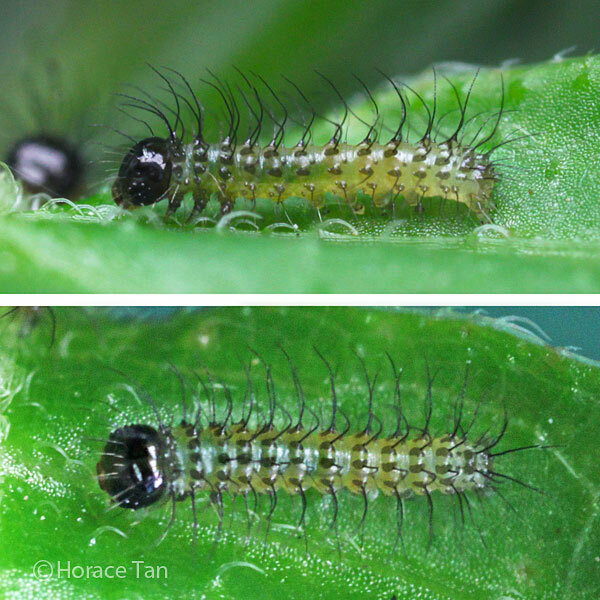 Two views of a 1st instar caterpillar, length: 3.4mm. Two views of a 1st instar caterpillar, dormant prior to its moult, length: 4mm. 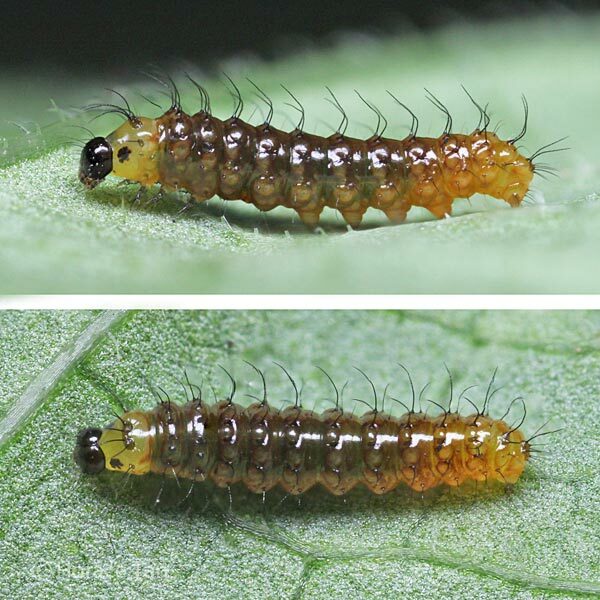 The body of the 2nd instar caterpillar is yellowish brown in base color with a dark green undertone. 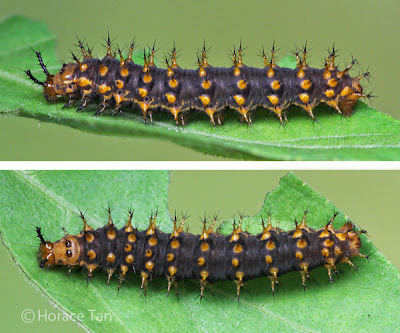 The same layout of tubercles as seen in the earlier instar is still present, but now short and stubby processes raise from tubercles, and several short and fine setae branche from each of these processes. The head capsule is honey yellow to orange with two moderately long and dark-colored cephalic horns. The ocelli on each side of the head are embedded in a dark patch. This instar lasts about 2 days with the body length reaching about 7.5mm. 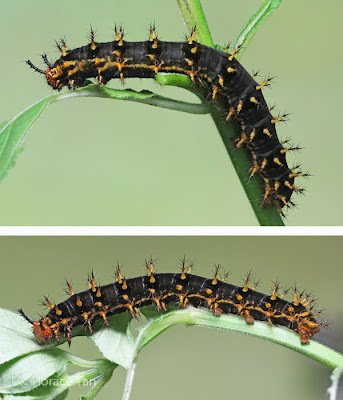 The 3rd instar caterpillar resembles the 2nd instar caterpillar closely except for the change of the body colour to mostly dark brown to dark purplish brown. Another discernible change is the proportionate increase in the length of the spiny processes covering the body surface and two cephalic horns. This instar takes about 2-2.5 days to complete with body length reaching about 11-12mm. 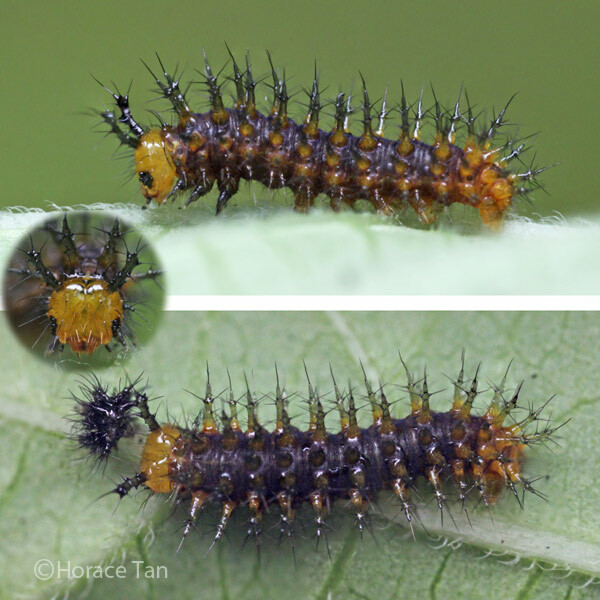 Two views of a 3rd instar caterpillar, early in this stage, length: 6.5mm. 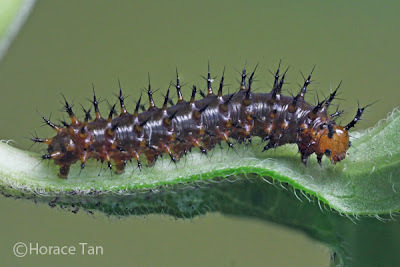 A 3rd instar caterpillar, late in this stage, length: 11mm. Two views of a 3rd instar caterpillar, dormant prior to its moult, length: 11.5mm. The 4th instar caterpillar has proportionately longer body processes and cephalic horns. Noteworthy is that the horns are even longer than the vertical dimension of the head capsule. 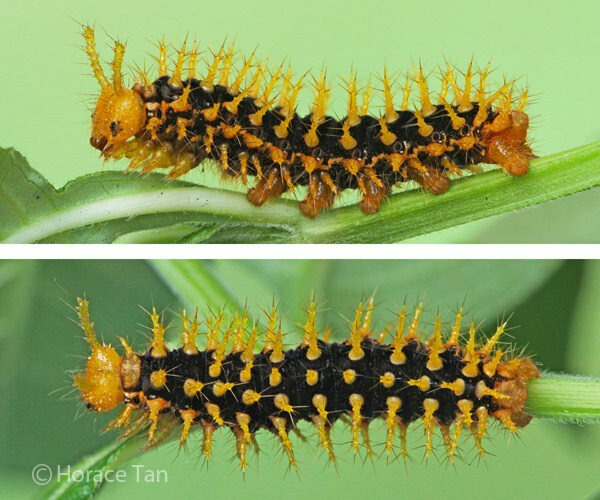 The long spiny processes have its colour changed (from the dark brown/black coloration seen in the 3rd instar) to yellow with only the terminal branches still in black. The cephalic horns remain black in colour though. 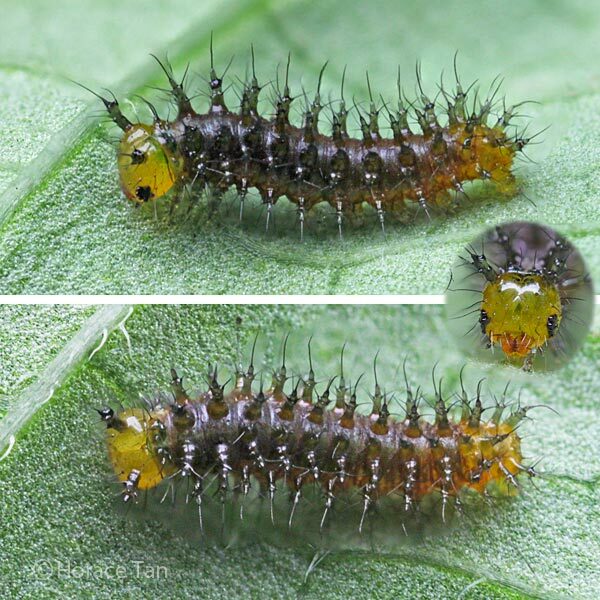 This instar lasts 3-3.5 days with the body length reaching about 20mm. 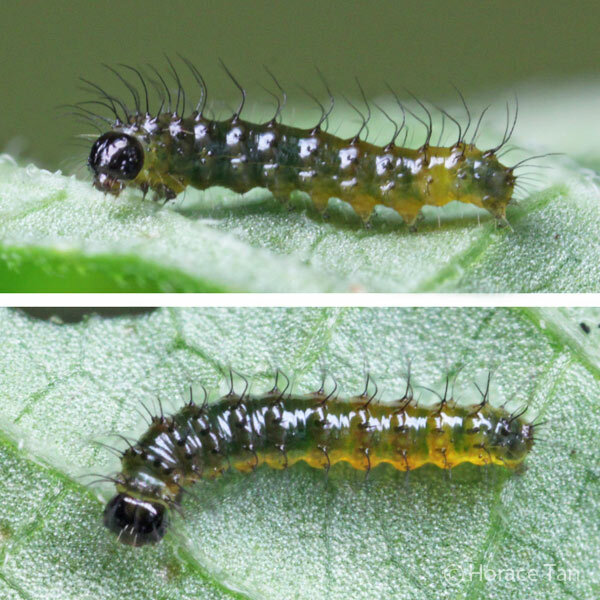 Two views of a 4th instar caterpillar, early in this stage, length: 11.5mm. 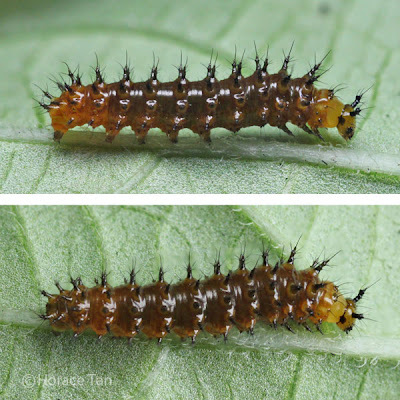 Two views of a 4th instar caterpillar, later in this stage, length: 16mm. 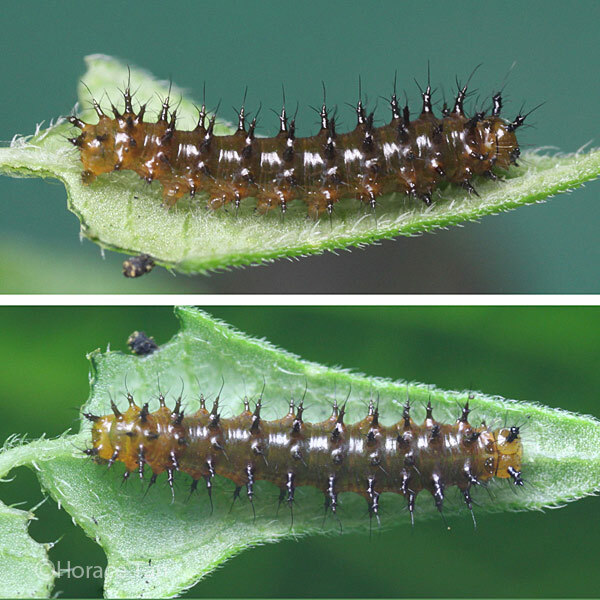 Two views of a 4th instar caterpillar, dormant prior to its moult, length: 18.5mm. 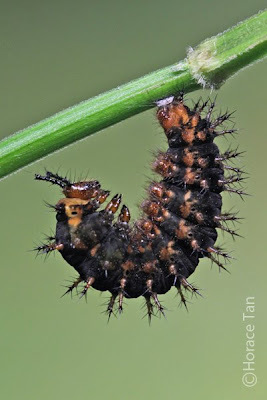 The 5th (and penultimate) instar caterpillar resembles the 4th instar caterpillar closely but with the body colour changes to a solid black which contrasts strongly against the bright yellowish coloration of the spiny processes. A new feature comes in the form of a sub-spiracular yellow line, intermittent at certain point, on each side of the body. 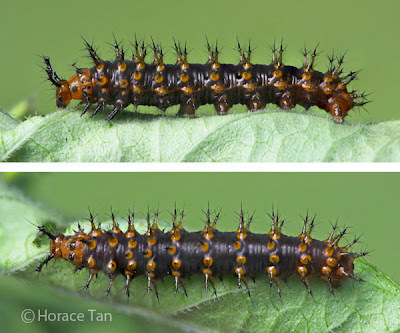 The 5th instar lasts for 3-4 days and the caterpillar body length reaches up to 34mm before the next moult. 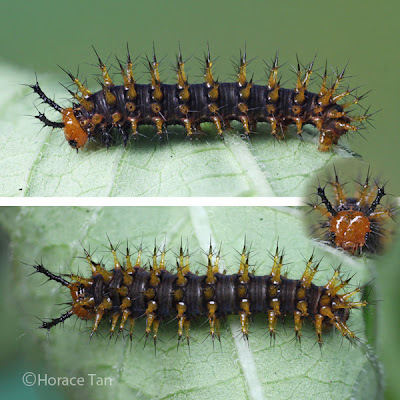 Two views of 5th instar caterpillar, early in this stage, length: 21mm. 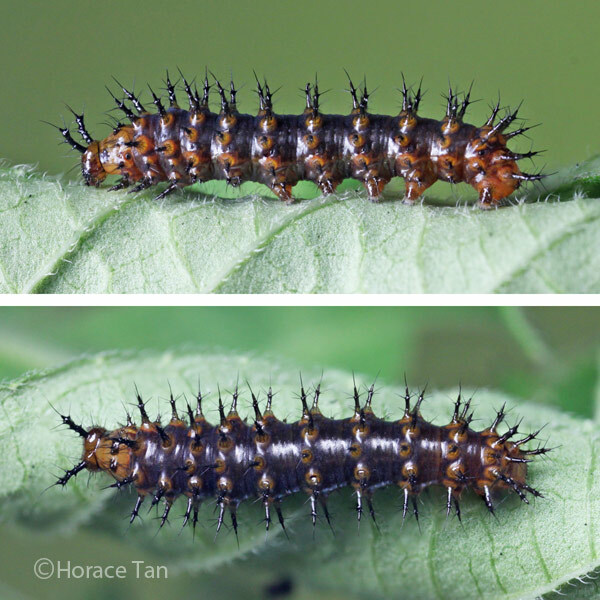 Two views of a 5th instar caterpillar, late in this stage, length: 33.5mm. 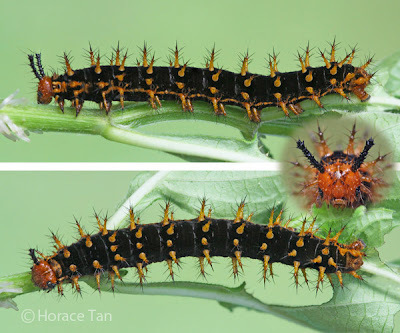 The 6th (and final) instar caterpillar resembles the 5th instar caterpillar closely with the only visible change being the presence of small dark patches on the head capsule in some specimens. 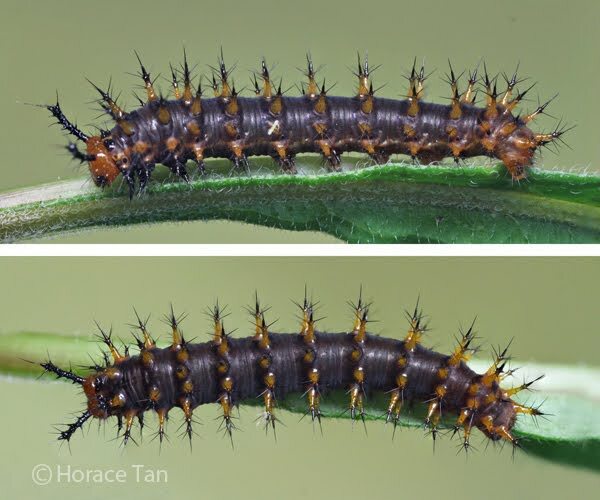 This final instar lasts for 6-7 days, and the body length reaches up to 60-63mm. Two views of a 6th instar caterpillar, newly moulted, length: 25mm. 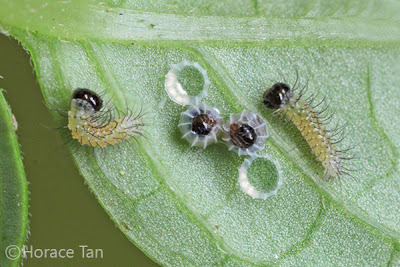 The head capsules of three different 6th instar caterpillars. Two views of a 6th instar caterpillar, length: 40 mm. 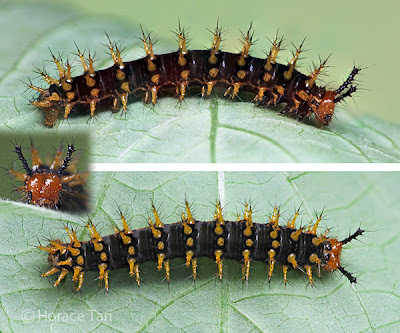 Two views of a 6th instar caterpillar, length: 47mm (bottom), 60mm (top). 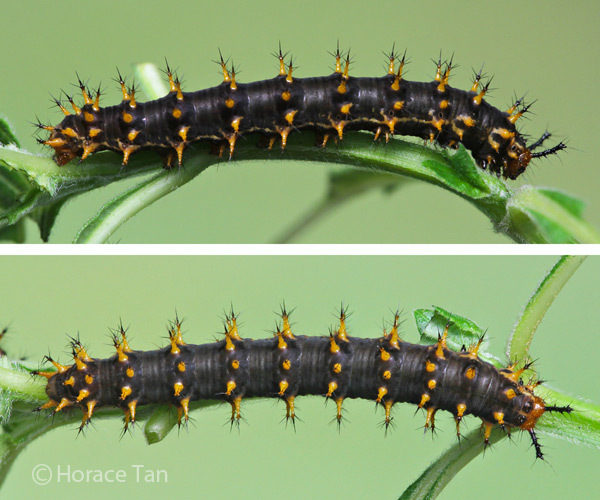 On the last day, the caterpillar ceases feeding and wanders around for a pupation site. The pupation site could be the underside of a leaf (not necessary that of the host plant) and stems/branches of a chosen plant. At this site, the caterpillar spins a silk pad from which it hangs vertically to take on the pre-pupatory pose. 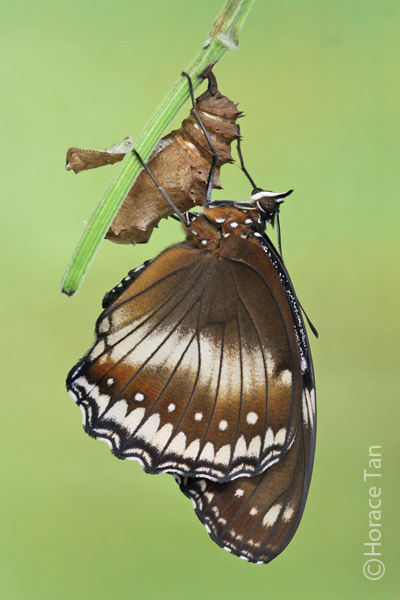 A pre-pupa of the Jacintha Eggfly. Pupation takes place about 1 day later. The pupa suspends itself from the silk pad with no supporting silk girdle. It is entirely pale to rusty brown with dorsal and dorso-lateral rows of short spiky processes, and two short cephalic horns. The leading edge of wing case is also adorned with two such short spiky protrusions. 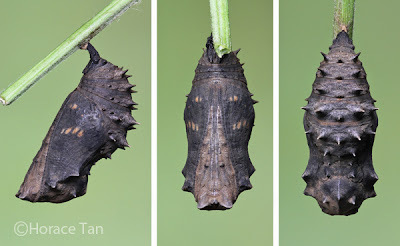 Length of pupae: 22-24mm. The pupation event of a Jacintha Eggfly caterpillar. 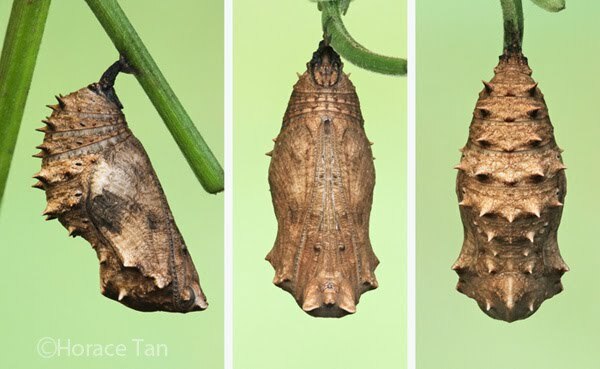 Three views of a pupa of the Jacintha Eggfly. Three views of a mature pupa of the Jacintha Eggfly. 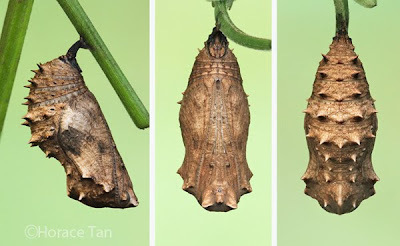 After about 5-6 days of development, the pupa turns dark as the pupal skin becomes translucent and the markings on the forewing upperside of the adult become discernible as a result. The eclosion event takes place the next day. 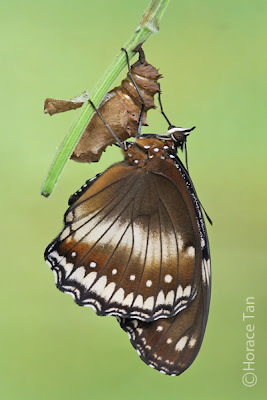 A newly eclosed female Jacintha Eggfly resting on its pupal case. A newly eclosed female Jacintha Eggfly.